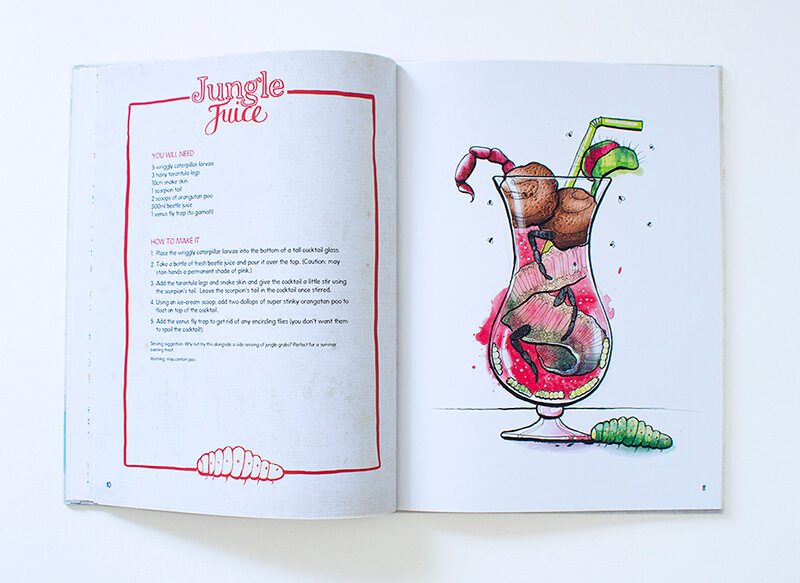 The Glorious Book of curious cocktails is a unique and quirky illustrated gift for children. This disgustingly delicious book teaches children all about onomatopoeia, alliteration and other literary devices. This humorous and educational book contains ridiculous recipes, fun activity pages and real recipes that children can make using edible ingredients. Children are encouraged to use language and drawing to invent their own silly recipes, developing literacy skills and imagination. Each illustrated book comes with a sticker sheet and activity book and is for children aged five to ten years old. The Glorious Book of Curious Cocktails is a disgustingly delicious recipe book I self-published that teaches children all about onomatopoeia, alliteration and other literary devices. This humorous book contains ridiculous recipes, fun activity pages and real recipes that children can make using edible ingredients. Children are encouraged to use language and drawing to invent their own silly recipes, developing literacy skills and imagination. One day, my little boy observed me illustrating cocktails for a drinks menu I was working on and he started laughing, hysterically. “You don’t put limes in drinks, silly!” He said. I asked him what he would put into a drink if he could make up a really silly cocktail and so we spent the next hour thinking up ridiculous ingredients and drawing our own disgusting drinks made of slugs, worms and other revolting things. We learnt about literary devices such as onomatopoeia and alliteration as we wrote out our silly recipes. I then illustrated the recipes and I decided to compile our ideas into a book: and so, The Glorious Book of Curious Cocktails was born. I wanted the book to be for both children and adults - beautiful to hold and look through yet utterly disgusting. This book is all about imagination and learning through fun. There is a section at the back for children to invent their own ridiculous recipes, writing their own ingredients and drawing pictures – using fun and imagination to problem solve through design and language. As well as nonsensical recipes there are recipes that are can be made with edible ingredients, giving an understanding of working with measurements and how different liquids and solids react when mixed together. This book involves imagination, problem solving, design, literacy, measuring and working with different materials, making learning fun in the process. I created the full design and content of the book, from recipe ideas, illustrations, hand drawn lettering, fonts, design and layout.